This is a neutral and unisex bounce house rental. 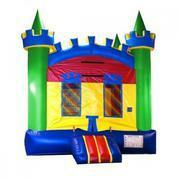 This Inflatbale bounce house includes a large bounce area, saftey ramp and basketball hoop. This Inflatable is unique and carries a royal flair to it, as it boasts square cut outs and castle turrets that are uniquely designed. Brightly colored and uniquley designed this inflatable bounce house is sure to bring many hours of fun to your children and their guests. This unit is a bouncing good time. Be sure to check out our Table and Chair rental packages. You will need a 100 outlet located within 75-100 ft of where we will set up. If renting at a park you will need a generator rental.